Dive deeper into the beating heart of your characters with acclaimed author David Corbett, in the newest iteration of his hit four-week writing workshop. David Corbett wrote the book on characters. Literally. The Art of Character: Creating Memorable Characters for Fiction, Film, and TV, published by Penguin Books, has earned a ton of accolades—every one of them deserved. He's also written incredibly rich characters in novels like The Devil's Redhead and Blood of Paradise. And he's an immensely-talented teacher, with the ability to deliver writing lessons in a clear, in-depth manner. 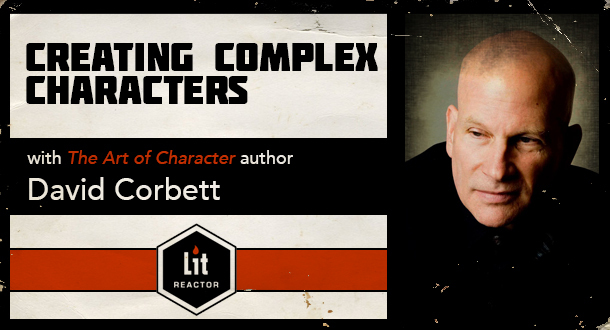 Here at LitReactor, he's taught several rounds of The Craft of Character, a hit class that consistently sells out. Now, get ready for Creating Complex Characters. In this class, students will explore how to bring real human depth and complexity to their characters by conceiving backstories through life-altering scenes, rather than lifeless information. They will learn how to move beyond role—protagonist, opponent, sidekick, conscience figure, love interest, etc.—to the personal characteristics that make fulfillment of that role not just possible, but necessary. They will also learn to identify the key backstory issues that will generate the story questions crucial to a compelling narrative arc. Because you can't sustain a book or a story without compelling characters. Vivid settings are good. Clever plot twists can keep people engaged. But if your reader can't identify with your characters, can't find something to project themselves on to, the game is over before it's started. David's writing assignments will guide you in putting your new skills into practice, and his detailed review and insightful analysis of your work, in addition to helpful critiques from your classmates, will solidify your command of the material. In addition, opportunities for questions and discussion will be available throughout the course. These crucial, core elements provide focus for all other backstory exploration: Desire/Yearning, Defense Mechanisms, Vulnerability, Secrets, Contradictions. It’s not a character’s appearance that matters, but how that appearance influences his action in the world and his relationships with others. Moments of extreme helplessness forge the character’s deepest understanding of who he is, what he can or can’t do (and why), and thus create the core elements of story. The character’s family, friends, work, religion, etc., situate him in the story world and identify his “tribe,” setting the parameters of who he can trust, who he shuns, and why. * Each week will include writing assignments designed to help you put your new skills to the test—assignments that will be critiqued by both David and fellow students. There will also be opportunities along the way to ask questions—both about the course material, and writing-related subjects. How to identify the outer desire and inner yearning that motivate the character’s pursuit of his objective in the story, and explain why that pursuit is both necessary and inevitable. How to use the story to attack and peel away those defense mechanisms, forcing the character into a braver, more honest awareness of himself and his world. How to create the most crucial element necessary to forging empathy for the character: vulnerability. How to craft the most crucial elements for creating depth and contrast in characterization: secrets and contradictions. How to conceive of the character’s physical nature as an element of behavior, not just his visual representation. How to conceive of your story to identify the key psychological questions you need to ask of your character, and how to flesh out the answers to those questions in pivotal scenes. How to identify the character’s “tribe,” with special attention to what defines inclusion or exclusion, and how willing the character is to transgress the rules that establish that tribe to pursue some key goal in the story. "David Corbett is a fantastic teacher. I was fortunate enough to attend three workshops with David at the San Miguel Writers Conference, and they were outstanding. Rave reviews from all who attended. When I saw he was offering an online workshop on The Craft of Character through LitReactor, I jumped at the opportunity to study with him again. I am so glad I did. David's comments on my characters and scenes were thorough, insightful and full of concrete suggestions that I could implement immediately. The improvement in my WIP was dramatic. I can't believe how much I learned in such a short time. If you want to push your writing to another level, take his classes." —Jane R.